Marshmallow Bird's Nests: These delicious marshmallows are my take on homemade Peeps, but in the form of bird's nests, and filled with mini Cadbury Eggs! Bunny Buns: These bunny buns come together in less than an hour and are almost too cute to eat! Resurrection Rolls: These rolls are fun to make, and eat, and they are a cute way to teach your kids about Easter. Posted by Melissa at 3/30/2013 09:17:00 AM 0 Yumm's!!! Does your family have holiday traditions? Growing up, we always did. (And I know Mike and I plan to carry them on for our baby girl!) My parents did a really good job of making sure that we knew the real reason for the holiday that we were celebrating. We didn't do Santa or the Easter Bunny, but that was just fine with me! My parents included other traditions that celebrated the real reasons for the holiday and we grew up knowing what we were celebrating. One way that we celebrated Easter was with these Resurrections Rolls. They come with a neat story that you can do with your kids to teach them about Jesus' death and resurrection. The rolls are empty when you bite into them--just like the tomb was empty on Easter Sunday morning. These would be a great project for this weekend! 1. Combine the sugar and cinnamon in a small bowl. 2. Flatten each buttermilk biscuit into a 5" round. 3. Dip each marshmallow in the melted butter and roll in the cinnamon sugar mixture. 4. Place coated marshmallows in the center of each biscuit. Pinch the dough around each marshmallow being sure it's totally sealed so the marshmallow doesn't escape. 5. Dip the dough balls in the melted butter and roll in the cinnamon sugar mixture. 6. Place dough on a greased cookie sheet. 7. Bake at 350 for 12-14 minutes, until golden brown. Allow the rolls to slightly cool before serving. Posted by Melissa at 3/29/2013 08:54:00 AM 2 Yumm's!!! Since Sunday, two of my friends have had three baby girls! Yes, one of them had twins. It's an exciting time for my group of friends right now as these are the first babies born of many due this year (myself included). These precious new lives are just so exciting! Spring seems to be the time of year that we all are thinking about new life. When I took Champ outside this morning, I heard the sounds of spring--robins! Flowers are starting to poke through the dirt (and some snow) in our yard. Now, if only it could warm up a bit so it would feel like spring instead of just looking like it. These bunny buns are the perfect spring bread, and they will make an excellent addition to your Easter dinner. I made these this past weekend, as we had a pre-Easter dinner with Mike's family. These buns were fun to make, and I was really impressed with how soft the dough was. They require a minimal amount of rising time, and from start to finish, can be made in less than an hour! 1. Pour milk into a small microwave safe bowl and microwave on high for 1 minute, until warm. 2. Sprinkle the yeast on the warm milk and set it aside to proof while you mix the other ingredients. 3. In the bowl of your stand mixer, use the paddle attachment to mix the flour, salt, baking powder, and sugar. 4. Cut in the shortening until the mixture resembles coarse meal. 5. Pour the milk and yeast mixer into the dough and mix using the dough attachment until the dough forms a ball and pulls away from the sides of the bowl. 6. Divide the dough into 15 equal sized pieces. 7. 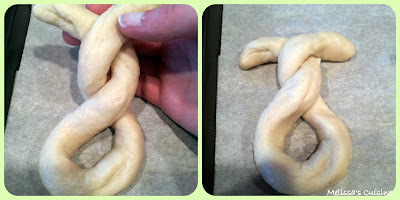 Roll each piece of dough into a long rope (like you're making pretzels). Set aside 1 strip to use for the bunny tails. 9. Divide the reserved dough strip into 14 equal pieces and roll them into balls to use for the bunny tails. Place the tails in the opening at the bottom of the buns. 10. Cover the bunnies with plastic wrap and set aside to rise in a warm place for 30 minutes. 11. Remove the plastic wrap and bake the buns at 350 degrees for 15-17 minutes, until golden brown. Also, I am participating in another great giveaway, and giving away a $15 Starbucks gift card! Click on the button below to enter! Posted by Melissa at 3/27/2013 09:19:00 AM 9 Yumm's!!! I love marshmallow Peeps. This time of the year, they're available in just about every store. I simply can't resist tossing a package into my cart each time I go shopping. Thankfully I only get groceries once a week! There's just something about the crunchy sugar exterior and the fluffy marshmallow interior that I absolutely love. A couple years ago, I tried my hand at making homemade Marshmallow Peeps. Admittedly, my chicks turned out looking more like walruses than birds, but they were delicious. Go ahead and check out my walrus peeps--it's okay to laugh! Since this week is Easter week, I wanted to come up with some fun Easter/Spring themed ideas to share. Last week I had a couple of nights that I couldn't sleep, so I laid in bed planning out this week's recipes. One of those late night brainstorms led the the idea of marshmallow bird's nests. I still have 3/4 of the bag of Cadbury Mini Eggs in my pantry and I knew I wanted to use them again. This recipe was the perfect use! The marshmallow nests were way easier to make than the marshmallow peeps. I just piped a circle with the marshmallow and then after I sprinkled the sugar on, I was able to reshape the nests if necessary. The sugar created a good barrier between my fingers and the sticky marshmallow. You'll want to work quickly as you make these because the marshmallow in the bag will start to set as you work. These were fun to make, and even more fun to eat! 1. Pour 1/3 cup cold water into the bowl of your stand mixer. Sprinkle gelatin over water. 2. In a medium saucepan, combine 1/4 cup water and 1 cup sugar. Stir over medium-heat until sugar dissolves. 3. Boil sugar, stirring occasionally, until it reaches a temperature of 238 degrees. 4. Pour syrup over gelatin. 5. Using the whisk attachment, start your mixer on the lowest possible speed. Once mixture has cooled, increase speed to medium-high. Beat marshmallow mixture until peaks form and the mixture is able to hold its shape. Mine took almost 15 minutes to reach this state. 6. Scoop marshmallow mixture into a large pasty bag with a half-inch tip (or for easier clean-up, use a gallon Ziploc bag and cut a hole in the end to pipe). 8. Pipe marshmallow into a circle. 9. Sprinkle the tops and sides of the marshmallow nest with sugar. If necessary, use your fingers to shape the marshmallow into a circle or flatten down any tips from where you ended piping. 10. Press 4 Mini Cadbury Chocolate Eggs into the center of each marshmallow nest. 11. Allow the marshmallows to harden, about 30 minutes. Store in an airtight container. Posted by Melissa at 3/25/2013 09:31:00 AM 11 Yumm's!!! Is life ever going to slow down? No? That's what I thought! This has been (another) crazy week! I think I've seen Mike for all of 3 hours all week, between his work schedule and each of us having meetings, it's been a crazy week. I have to admit, our meals have been severely lacking this week. I think I only made one meal all week! Oops... Here's to hoping next week is a little less hectic. Biscoff Bars--A perfectly flavored Biscoff blondie, accented by chocolate chips. Pizza Casserole--A family favorite and Mike's most requested recipe. I'm sure it will be a favorite in your household as well! Spring Caramel Cheerio Bars--A festively decorated caramel cereal bar. 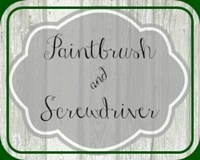 I was able to sneak away some time to spend on Pinterest this week. Here's what caught my eye! Hot and Gooey Cinnamon Toast Sandwich--A sweet grilled cheese sandwich coated in cinnamon sugar? Sounds like my kind of sandwich! Loaded Chicken and Bacon Tater Tot Casserole--This looks like a simple and delicious casserole. It's on my menu plan for this week. Carrot Cake Monkey Bread--I love Monkey Bread, and this version looks perfect for Easter breakfast! 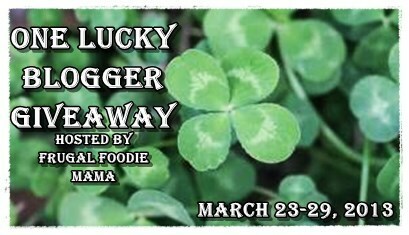 While you're here, don't forget to enter the One Lucky Blogger Giveaway! Posted by Melissa at 3/23/2013 09:24:00 AM 0 Yumm's!!! The right exposure and promotion is blogger gold! *This giveaway is open internationally. You MUST be a blogger with an active blog to win. All entries for the winner will be checked and verified, so please make sure you are doing what you are claiming in the Rafflecopter or all your entries will be voided. No funny business, folks. ;). By entering you give the right to use your name and likeness. Number of entries received determines the odds of winning. One winner will be selected. This is a giveaway sponsored as a group buy, which means the bloggers pooled their money together to purchase this product for you. Target, etsy, and Starbucks are not sponsors of this giveaway. Any all all social media outlets used in the Rafflecopter are not sponsors of the giveaway or are responsible for this giveaway in any way. 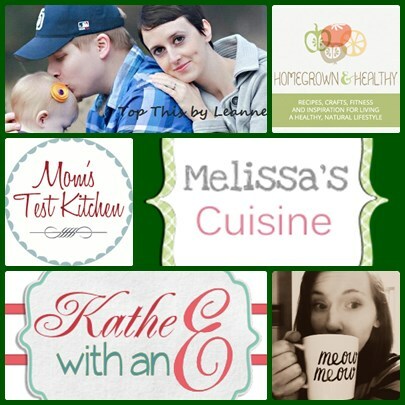 Gift card prizes will be sent as egifts via Carrie of Frugal Foodie Mama. Each individual blogger that has provided ad space for the giveaway is responsible for awarding the winner their ad spots in a timely manner. Protected tweets do not count as an entry method for tweeting. Tweets must come from a public account. Bloggers in this group giveaway and their immediate family members in their household cannot enter or win the giveaway. No purchase necessary. Void where prohibited by law. Please see the Rafflecopter widget below for additional Terms and Conditions. Good luck, all! Posted by Melissa at 3/23/2013 12:00:00 AM 1 Yumm's!!! It's Spring! Well, at least, the calendar says it's Spring. The snow and temperature outside seem to have missed that memo this year. I decided that I needed some Spring in my life so I decided to make some Spring treats. Enter Easter Candy! I love Chocolate Covered Cadbury Eggs and the colors are perfect for Spring. I picked up a giant bag at the bulk store a couple weeks ago and it's been sitting on my counter taunting me ever since then! These bars were a great use for a few of these candies. 1. Measure cereal into a medium mixing bowl. 2. Place unwrapped caramels and water in a small microwave-safe mixing bowl. 3. Microwave caramels on high for 1 minute and then stir. Microwave 1 minute more and stir until smooth. 4. Pour the caramel over the cereal and stir to coat the cereal. 5. Press the cereal into a greased 9x13" pan. 6. Press the Cadbury Eggs onto the top of the bars. 7. Place the white chocolate chips in a small microwave-safe bowl and microwave for 30 seconds. Stir and microwave for 15 more seconds. 8. Drizzle the melted chocolate over the cereal bars. 9. Allow the bars to cool and chocolate to harden, at least 1 hour, before cutting into squares. Posted by Melissa at 3/22/2013 07:48:00 AM 7 Yumm's!!! I have great in-laws! I know there are a lot of people who might think I'm crazy for saying that...Everyone has heard stories of terrifying mother-in-laws. But, I really am truly blessed to have married into a great family. I know Mike would say the same about my parents. We all get along really well. In fact, our parents often will get together without us and play cards. One great thing about everyone getting along so well is that we are able to combine a lot of holidays. The first year we were married, Mike and I hosted Thanksgiving dinner at our house for both of our families. My parents hosted the next year and we hosted again this past Thanksgiving. We also spend our Easter Sundays with the combined families. This year, we'll be enjoying time together at my parent's house. It's wonderful to be able to spend the time together so we don't have to figure out whose house we'll be at, or have to eat multiple Easter dinners in one day. Mike and I also make a point of eating one meal a week with our parents. We go to my parent's house every Sunday after church for lunch and games. Every Thursday night we go to Mike's parent's house for dinner. Not only does it mean I get a night off from cooking, it also means that we get to spend extra time with our families. We've been doing this since we got married 2-1/2 years ago and I don't imagine we'll end this tradition any time soon. This pizza casserole is one of Mike's most requested dishes when we eat at his parent's house. It's fairly simple to make and it feeds all 4 of us, plus enough leftovers for Mike to take to work the next day. (Bonus!) It has all the components of pizza--pepperoni, cheese, and tomato sauce, mixed with ground beef and pasta. This recipe was passed on to us from Mike's mom and I'm sure it will always be a family favorite! 2. Cook noodles according to the directions on the box until al dente. 4. In an oven safe dish, mix together noodles and meat mixture. 5. Stir in 1.5 cups of mozerella cheese, most of the pepperoni, and any additional toppings you desire. Posted by Melissa at 3/20/2013 09:36:00 AM 8 Yumm's!!! On Saturday, Mike and I finished putting together our nursery furniture. We bought a 4 piece set about a month ago, and we've been putting together about one piece each week. We've had quite the adventure setting it up, and I think we're both happy it's finally finished! The first day we opened up the box of pieces, we were completely astounded by all the little parts and the lack of instructions. Seriously, we couldn't find the instructions anywhere. Thankfully, we were able to print off a copy from the company's website. Then we began to set up the dresser and realized how useless the instructions were. All they had were diagrams, but they were hard to decipher and were not always clear. We had the dresser about halfway done before we realized we had put the left side on the right side and needed to take it apart and restart. Of course, the instructions just told you to attach part A to part B. There were no words to tell you to that those pieces needed to go on the right side, not the left side. The only way to tell was through trial and error. Unfortunately, we ran into this issue with the crib and the changing table as well. Let's just say that by time we finished with the changing table on Saturday, we were thrilled to be finished with the stress of putting the furniture together. Thankfully, I had just the dessert we needed to wipe away our stress. Everyone knows desserts is stressed spelled backwards! I chose these Biscoff Bars after browsing through Jennifer's blog, Mother Thyme, for this month's Secret Recipe Club. Her blog is filled with stunning pictures and delicious foods. My list of recipes was long, but these Biscoff Bars won the spot at the top of the list. The Biscoff flavor really shined through in these bars. The chocolate chips added the perfect amount of sweetness. I didn't have enough Biscoff cookies in the house, so I eliminated the crust and just went with the bars for this recipe. These were a hit in our house and I'll certainly be making them again! 1. In a large bowl, cream together the butter and sugar using an electric mixer. 3. Add the vanilla and Biscoff spread and beat until the mixture is creamy. 4. 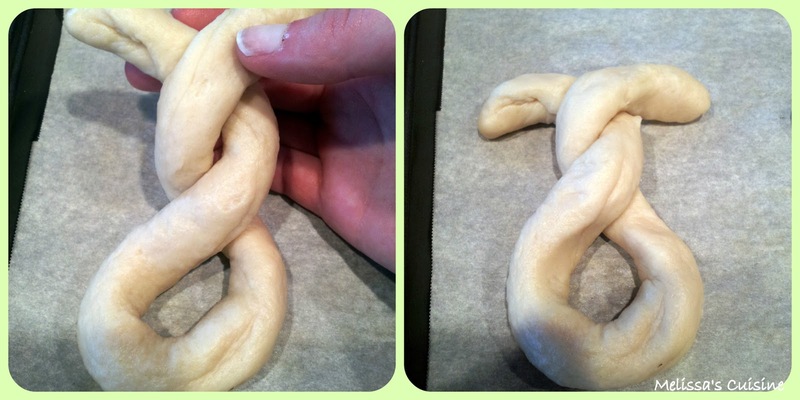 Stir in the flour, salt, and baking powder and mix until it's all combined. 6. Spread the batter into a greased 8x8" baking pan. 7. Bake at 350 for 45-50 minutes, until a toothpick inserted in the center of the bars comes out clean. Cool bars completely before cutting into them. Posted by Melissa at 3/18/2013 08:16:00 AM 21 Yumm's!!! What a week! I feel like I say that nearly every week, but this week was especially crazy! Mike worked 12 hour shifts all week, starting between 4 and 5 each morning. We had to keep up with our usual weekly commitments, as well as some extras, on top of his busy schedule. I know I'm not the one working the long hours, but it does affect me too because early to rise means early to bed. Our evenings are so short that it feels like I make dinner, clean up, sit for a few minutes and then go to bed. I ended up only making one meal this week, the rest were leftovers or take-out. I feel like a total slacker, but I'm hoping next week will be a little less hectic! How was your week? 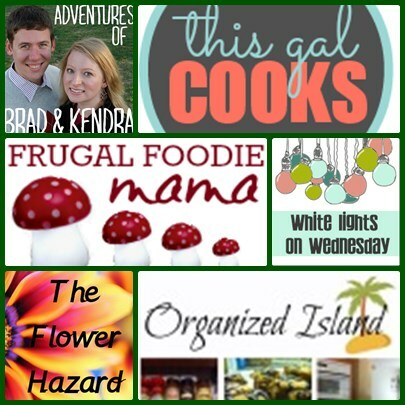 Despite the busyness of this week, I was still able to get some great recipes up for you. On Monday, I shared our exciting news: We're having a baby girl! I forgot to tell you our parent's reactions as they bit into the cupcakes. My mom was already convinced it was a girl, so she was so happy when she saw the pink icing. My dad couldn't see the frosting in his cupcake, so he had no idea what we were having until my mom showed him hers! Mikes parents both saw the pink icing and were thrilled--Mike's mom also guessed we were having a girl. We are so excited! Gender Reveal Cupcakes--A fun way to tell your friends and family the gender of your new baby! Crock-pot Chicken Spaghetti--This simple and delicious meal has quickly become a favorite in our house! Blueberry Scones--These tender flaky scones are melt-in-your-mouth delicious! 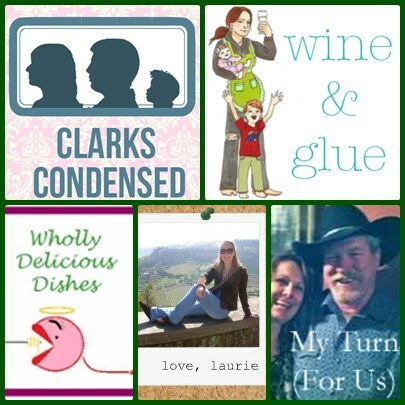 Here are some of my favorite pins from this week! Homemade Peanut Butter Eggs--PB cups are one of my favorite candies. I can't wait to make these! Mini Hot Ham Sandwiches--These sandwiches look amazing! The best part is you can make them ahead of time. I'm thinking these will make a great baby meal! Peanut Butter Cup Cheesecake--I'm seeing a trend with PB and chocolate this week. This cheesecake looks positively decadent! 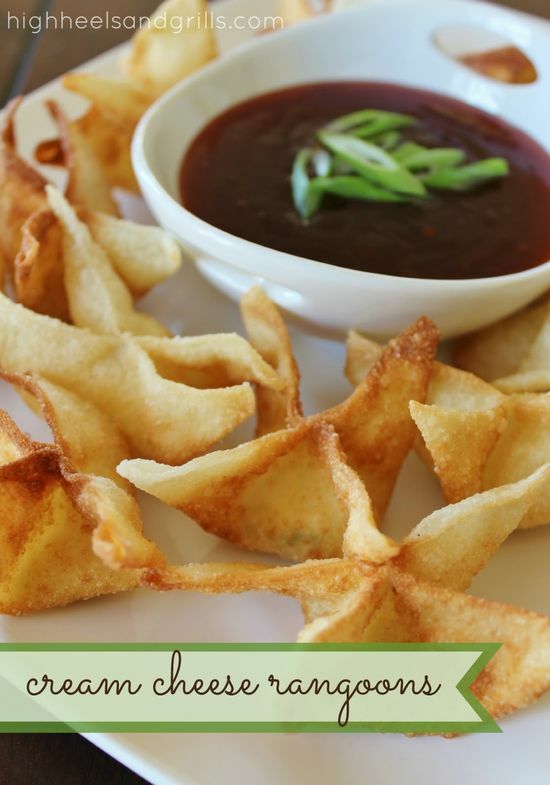 Cream Cheese Rangoons--Crab Rangoons are my favorite thing to eat at Chinese restaurants. I am so excited to have a great recipe to make at home! Are you on Pinterest? Please leave me a link to your boards in the comments so I can follow you! Posted by Melissa at 3/16/2013 09:41:00 AM 0 Yumm's!!! I love Fridays! I'm blessed to have the day off of work, so Fridays are the beginning of my weekend. I love being able to get my errands and baking done on Fridays so I can spend the rest of the weekend relaxing with Mike. But, truth be told, my absolute favorite thing about Fridays is that I can enjoy a nice relaxing morning. To me, that translates into a delicious breakfast. Most mornings I don't have time to fix a really good breakfast, and on Fridays I have time for that! Often I'll make a big batch of pancakes that I'll keep in the freezer and pull out each day during the week. Last week, I decided that blueberry scones sounded good. Thankfully, it was a Friday, so I was able to whip up a quick batch. By time I finished getting myself ready for the day, the scones were ready to come out of the oven. I was thrilled with how this recipe turned out. I grew up eating scones, but my mom's recipe is quite dry (don't worry, she knows!). These scones are incredibly moist and flaky. This will certainly be my go-to recipe from now on! 1. In a bowl, combine the flour, sugar, baking powder, and baking soda. 2. Cut the butter into the dry mixture until crumbly. 3. Stir the heavy cream into the crumb mixture until just moistened. 4. Gently knead in the blueberries. 5. On a floured surface, pat the dough into a 9-inch circle. 6. Cut the dough into 8 wedges and place on a parchment lined cookie sheet. 7. Brush the tops of the scones with the milk. 8. Bake at 400 for 20-23 minutes, until golden brown. Posted by Melissa at 3/15/2013 08:17:00 AM 10 Yumm's!!! These days, that seems to be the best dinner plan I can think of. Mike's been working 10-12 hour days and because he starts at either 4 or 5 in the morning, that means we go to bed pretty early. By time I get home from work, if it takes me an hour to prep dinner, we'll have about 1 hour to relax before getting ready for bed. As you might guess, that just doesn't fly. That's where Crock-pot meals come in so handy! I first made this recipe after seeing a similar one on Pinterest. I didn't have a lot of the ingredients in the house for the original recipe, so I adapted it to use what I did have in the house. I had Mike start the spaghetti noodles so they would be almost done when I got home and within 15 minutes of walking in the door, we were eating dinner. My friend is expecting a baby girl any day now, and so a couple weeks ago we spent a Saturday afternoon stocking her freezer with meals. This Chicken Spaghetti was such a hit with Mike and I that she made it as well. It freezes wonderfully and one recipe makes 8-10 servings. We were able to fill 3 large containers for her and her husband to enjoy while they spend time with their precious newborn. 1. In a medium bowl, combine the condensed soup, milk, minced onion and minced garlic. 2. Place the chicken breasts in your Crock-pot and pour the soup mixture over them. 3. Cut the Velveeta cheese into cubes and place in the Crock-pot. 4. Cook on low heat for 8 hours. 5. Around 30 minutes before you're ready to eat, cook the spaghetti noodles according to the directions on the box. 6. While the pasta is cooking, shred the chicken in the Crock-pot with 2 forks. 7. Add cooked noodles to the chicken mixture. Posted by Melissa at 3/13/2013 09:34:00 AM 6 Yumm's!!! After 20 weeks of waiting and excited anticipation, Mike and I had our ultrasound on Thursday and found out that in July we will be having a baby girl! We are so excited to welcome our daughter into the world. Part of me hopes the next 20 (or fewer) weeks fly by, but I love being pregnant so I'm also hoping it goes slow so I can enjoy every minute. We wanted a creative way to tell our parents the gender of our baby. After surprising them with the big news on Thanksgiving day and our fun announcements in January, we knew we couldn't just tell them "it's a girl". I'd seen the idea of gender reveal cupcakes many times and so we decided that was the route we would take. I had some leftover pink frosting from my Strawberries and Cream Cake, so that was really handy to have to fill these cupcakes. 1. Scoop about 1/3 of the frosting out of the container and into a small bowl. Add 2 Tablespoons of the Jello mix and stir until the color is evenly distributed. 2. Scoop the colored frosting into a pastry bag with a large tip (the bigger the hole in the tip, the easier to fill the cupcake). 3. Insert the tip into the top center of the cupcake and squeeze the frosting into the cupcake. Repeat with each cupcake and the pink frosting. 4. Scoop the white frosting into a pastry bag and decorate the top of the cupcakes as desired. 5. Top with sprinkles or other garnishes, if desired. Enjoy sharing your happy news with friends and family! Posted by Melissa at 3/11/2013 09:38:00 AM 16 Yumm's!!! I'm pretty sure I missed out on Girl Scout cookies this year. I don't always buy them, but this year a box of Tagalongs sounded pretty good. Apparently we had some Girl Scouts come to our house selling cookies, but Mike didn't think we needed any so he sent them away. It was only after I told him that I wanted Tagalongs that he told me the girls had stopped by. I waited too long to buy any and now from what I hear, it's too late. So what's a girl to do? I decided if I couldn't buy the cookies, I'd just make my own! I opted to use Gamesa Galletas Marias Cookies as a base, in the interest of both time and lack of desire to bake cookies. (If you can't find these cookies, feel free to use your choice of flat cookie or make your own.) When I reached into the cupboard for my jar of peanut butter, I got distracted by a jar of Biscoff Spread. Oh boy! I put the peanut butter back and decided that Biscoff Tagalongs were sounding too enticing not to make. I was thrilled with how these turn out. It turns out that Biscoff and chocolate go together as well as peanut butter and chocolate. My parents and Mike were big fans of these cookies as well. And, I've converted my mom to a Biscoff lover! 1. Spread about 1 teaspoon Biscoff spread onto each cookie and place on a wax paper lined cookie sheet. 2. In a microwave safe bowl, combine the chocolate chips and coconut oil. Microwave in 30 second intervals until the chocolate is melted and smooth. 3. Scoop about 1 teaspoon of melted chocolate on top of each Biscoff topped cookie. It will spread out on its own, but if it doesn't, spread it over the cookies with the back of a small spoon. 4. Allow the chocolate to completely dry, about 30 minutes. Store cookies in an airtight container at room temperature, or in the fridge if the chocolate is too soft at room temp. Posted by Melissa at 3/08/2013 10:48:00 AM 4 Yumm's!! !